This knitting needle case tutorial uses one long piece of fabric, which is folded to create roll with a pocket for the knitting needles. It uses two contrasting fabrics for decoration and the smaller pocket for round knitting needles, cable needles and crochet hooks. The finished knitting needle organizer case measures 18 by 12″, with 9″ deep pockets to hold the knitting needles in, and a 6″ deep pocket for smaller items. Fold the bottom of the base fabric in by 9 1/2″. Press. Iron over a double fold along the long length of the 2 by 14″ second contrasting fabric. Iron over 1/4″ along the opposite edge. Place the raw edge of the main fabric in between the double fold. Sew this strip onto the pocket. Mark the vertical stitching lines, using a quilters ruler and fabric marker, I make mine 1.5” apart which allows room for about 3 pairs of knitting needles. 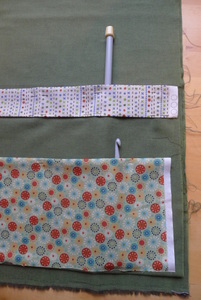 Stitch along the vertical lines to create the pockets for the knitting needles. Double fold and press the long length of the top of the crochet pocket out of the first contrasting fabric, for the crochet hooks, cable needles etc. Place this piece of fabric onto the inside of the bag and pin in place. Follow the stitching lines from the knitting pocket down, skipping the first and third stitch line to create two pockets double width to allow for circular knitting needles. I like to decorate the outside of the bag with the two remaining strips of contrasting fabric. Press and fold in 1/4 along the long edges. To try and ensure the best straight parallel lines use the fabric pattern as a guide plus a rule. Alternatively, use a stiff card to fold the fabric over and press to get a good straight fold. Place these on and stitch in place. Cut a piece of ribbon 65cm for tying round your rolled knitting needle case, fold in one third/two thirds. Tack in place so it doesn’t slip. Fold the roll right sides together and pin in place. Stitch down the two long sides of the bag. Turn the bag the right side out and press. Finally fold over the final seam at the bottom. A double fold with fabric from the front of the bag makes a good finish to the inside bottom of the bag. "Storage ideas for knitting needles, how do you store yours?" "Craft Activism?? Race Against Hunger Campaign.. fancy sewing a jigsaw piece??" Great job! I wish I could finish something that cute in an hour! Thanks for visiting me and commenting at OneCreativeMommy.com! Good tutorial! You’ve got some lovely things in your Etsy shop too!